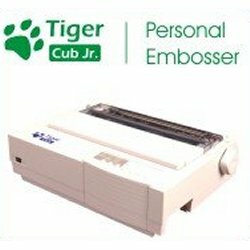 The Cub Jr. Braille Embosser is the most compact and affordable ViewPlus embosser, but still boasts all the benefits of being Powered by Tiger. The Cub Jr is quiet and makes it easy to emboss high-resolution tactile graphics and braille. The Tiger� Software Suite is bundled with the ViewPlus Cub Jr. Braille Embosser. * Paper Size Width 4" to 9.5"